The Costeño con Cuernos are of the Criollo type and were developed from Spanish cattle brought to America in the 16th century. This breed is typically utilized as a draft animal and milk production. They are usually red or orange, sometimes chestnut, with lyre shaped horns. 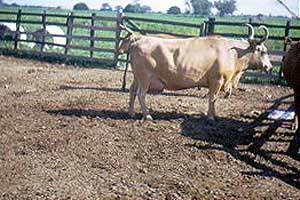 They were selected for milk production due to their udder conformation and increased milk yield in comparison to the other indigenous breeds of South America of larger size. Cows weight approximately 500 kg at maturity and bulls 700 to 750 kg. The Romosinuano breed of northern Columbia was developed from this breed.